Where does one begin when reviewing Casablanca and how high do I rate it? Given that it is probably my favorite movie to date, I might be tempted to give it a 10; however, as we still have almost 70 years remaining on our cinematic journey, a 9.5 feels appropriate. Casablanca has everything going for it – a great story, great acting, great directing, great cinematography, even great music. Obviously, I think this movie is great! Set in World War II Casablanca, the story revolves around refugees of varied socioeconomic backgrounds attempting to flee war-torn Europevia letters of transit obtained through whatever means possible. But this story is merely a backdrop for the real story, the ill-fated love triangle of Rick Blaine (Humphrey Bogart), Ilsa Lund (Ingrid Bergman) and Victor Laszlo (Paul Henreid). Although none of the actors or actresses won any Academy Awards, stellar performances abound. Favorites among the cast members include Captain Louis Renault (Claude Rains), Major Heinrich Strasser (Conrad Veidt), Signor Ferrari (Sydney Greenstreet), Ugate (Peter Lorre), and of course, Sam (Dooley Wilson). Casablanca is a must see on every film critics list and certainly on mine. There are so many things that are wonderful about the film Casablanca, that it is hard to properly organize one’s thoughts. Casablanca has been enshrined in our minds as the quintessential film of classic Hollywood for a reason, and I am at a loss to name a single fault in the film. It is a film that defies genre classification, and its universal appeal is hard to replicate. In all honesty, I wouldn’t be able to name a single city in Morocco if this film hadn’t put the city of white houses on the map. The genius behind this cinematic masterpiece, director Michael Curtiz, also brought us the classic films Yankee Doodle Dandy, Angels with Dirty Faces, and White Christmas. Curtiz provided the next step from 1942’s Mrs. Miniver, and used the global conflict as the background to frame a larger plot around rather than produce another propaganda film. Curtiz didn’t really need to worry about making propaganda films, because Frank Capra was taking charge of that realm of filmmaking with the Why We Fight series. To try and distill the reason why Casablanca remains one of the best motion pictures of all time into one specific reason, would be a futile and pointless effort. Casablanca is the product of the universe aligning to provide an example of what happens when every fixture of a film works in perfect harmony to create a visual opus. It is hard to imagine that I wrote a paragraph on the film without mentioning the inimitable Humphrey Bogart. When I hear someone say Bogey, I don’t think about golf, I think about this magnificent man. The majority of the film’s action takes place in Rick’s Café Américain, and Bogey plays the proprietor of the establishment, Rick Blaine. I do not think that anyone who has ever been born could play a better mysterious leading man with a concealed past and steadfast morals, than Bogey did. It was also a fantastic casting decision to have Peter Lorre play a supporting role to Mr. Bogart, in a reprise of their superb on-screen dynamic first exhibited in 1941’s Maltese Falcon. 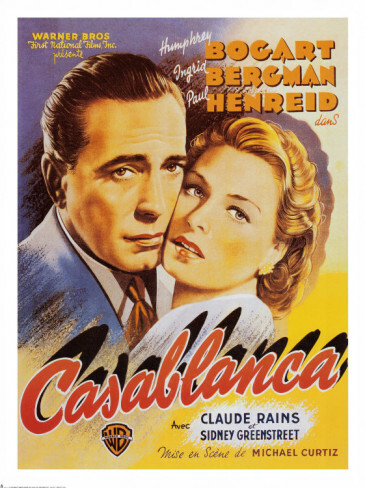 The entire premise of the film involves life in the geographical purgatory of Casablanca, which is located along the escape route for French refuges seeking asylum in America. For many trapped in this French-owned African colony, life is about waiting to either escape toAmericaor for war to end. However, in this diplomatic gray area, most people must resort to using the black market to obtain the necessary documents and paperwork to ensure their exodus. In the mean time, Rick’s Café Américain provides a taste of Western culture in an otherwise barren landscape. While Rick adamantly tries to abstain from engaging in political matters concerning the growing divide between French loyalists and German officers, a series of events unfolds that forces him to rethink his role as Switzerland. Rather than spill out the rest of the plot summary that you can read on Wikipedia or IMDB, I want to highlight two of my favorite scenes of the film. The first of which, is a scene that contains the most moving presentation of the La Marseillaise (The French National Anthem) that has ever been portrayed in film. The scene is set in Rick’s and takes place after the arrival of Victor Laszlo. A group of German soldiers at Rick’s are inebriated at the bar, and begin singing the German national anthem. In the sake of full disclosure, I have no idea if it is the Nazi National Anthem or the German National Anthem. Victor Laszlo stands up in the bar and begins to sing La Marseillaise, and slowly more and more patrons of the bar join Laszlo in song. This leads to a cacophonous battle of music between the German soldiers and the stranded French citizens. Then, in a triumphant moment, the French song crescendos to completely drown out the German voices. This is the turning point of the film, and causes the politically abstinent Rick to realize the importance of Laszlo to the underground cause. The second important part of this movie that I would like to highlight is the evolution of Hollywood in its portrayal of the black piano player, Sam (Dooley Wilson). Now I need to write a small concession before I explain myself, I am not saying that in 1943 Hollywood had finally overcame its issue of race portrayal in film. In fact, I am willing to argue the point that it still hasn’t overcome it. However, I want to applaud Casablanca for refusing to make Sam a caricature. I understand that as one of the only black people in the movie, his portrayal of a piano player could tread the Gone With the Wind line and ignore the vibrant Black culture in America at that time. However, Casablanca very clearly denotes that Sam is a minority owner of Rick’s and that he and Rick have been lifelong friends. Also, Dooley Wilson is insanely talented and if I had unlimited money I would pay for his hologram to play As Time Goes By at my wedding. While race portrayals of most 1940’s films are still incredibly dated, a nice way of saying racist, it was at least nice to see that one screenwriter wrote a role that positively portrayed a black man in early Hollywood. I know I have said this before in my review of Gone With the Wind, but this film trumps my previous recommendation. You must see this film. There hasn’t been a single film we have seen thus far that is as cinematically important or as well done as Casablanca is. It seems fitting that I pen my Mrs. Miniver commentary on Memorial Day 2012 given the movie’s patriotic theme. Director William Wyler acknowledged he made the film as a propaganda vehicle to encourage American support against the Nazi aggression in Europe. He portrays the idyllic pastoral life of the English Miniver family in the months leading up to the German attack on England, and the dramatic upheaval the family and their town faces as England enters World War II. The Joseph Ruttenberg award-wining black and white cinematography is superb, and the interior scenes of an upper-middle class British household are beautiful. The prologue describes the Miniver household as an average English middle-class household but their extravagant purchases of clothing and a luxury automobile belie that description. The attractive Greer Garson claims Best Actress honors for her strong portrayal of Mrs. Miniver. The Oscar winning screenplay crafted by a team of four writers trace Mrs. Miniver’s evolution from a housewife whose primary concern is clothes shopping, to a concerned mother of a fighter pilot and ardent supporter of the British war effort. Some of the more memorable scenes include Mrs. Miniver’s capture of a German parachutist, aerial battles, and the anxious family’s hunkering down in their bomb shelter unsure if the next bomb could be a direct hit or if their house would still be standing when they emerged. Walter Pigeon is well cast as Mr. Miniver. He joins the community effort to help rescue trapped British troops at Dunkirk, while his wife is left behind worry about his return. The town faces a series of air raids, blackouts and, inevitably, the death of many innocent civilian villagers, young and old. Teresa Wright took home Best Supporting actress honors as the ill-fated love interest for Mrs. Miniver’s RAF son, Vincent. I also enjoyed the side story of the annual town flower show and the town’s determination not to let the war cancel the festivities. This film was the number one box office hit of 1942 as its patriotism resonated with American audiences. Winston Churchill even commented that the film was worth more to his nation than a dozen battleships, and President Franklin D. Roosevelt encouraged all Americans to view the film. While we have viewed films with war-time themes, Wings, All’s Quiet on the Western Front and Cavalcade, this is our first film that was actually produced in the time of the war being portrayed. Although I don’t consider the film ground-breaking and at times it is predictable; nevertheless, Mrs. Miniver is interesting in its historical context. 1942’s Best Picture winner, Mrs. Miniver, is our first film to be released after the United States joined WWII. Interestingly enough, rather than tackle the war through an American perspective, the film is based on the home life of a middle-class English family. This film has aspects of many genres melded together to portray a strong and resilient family attempting to adapt to the constraints of war. Directed by William Wyler, Mrs. Miniver acts as both war-time propaganda as well as a heart-warming family drama. The film incorporates beautiful symbolism and metaphors in their story-telling as the family deals with real destruction on the home front. Seeing the destruction in lives of fellow Allied countries was a good tool to incite more of a response from people in the United States, who didn’t have to deal with the nightly blitzkriegs of their allies. One of my favorite scenes in the film involves the family gathered for safety in a bomb shelter reading out scenes from Alice’s Adventures in Wonderland. It seems as if the war had brought the family down the rabbit hole, and it was impossible for the family to not use escapism as they prayed for their safe keeping during the raid. Mrs. Miniver works on a variety of levels, the first of which being an impassioned albeit abbreviated love story between the Miniver’s altruistic son Vin Miniver (Richard Ney), and the aristocratic granddaughter of Lady Beldon, Carol Beldon (Teresa Wright). While the couple does not have much exposition allotted for their courting period, they decide to get married due to the circumstances of the war. It’s hard for your heart not to break hearing Carol describe that she needs to spend as much time with Vin as possible, because she is not sure how much longer her airplane flying husband can dodge death’s fateful grasp. Another layer of the story is the flower show held in town, with the prodigious prize for best rose usually claimed by Lady Beldon (Dame May Whitty), who is Carol’s grandmother. However, this year the local stationmaster Mr. Ballard (Henry Travers) has cultivated a beautiful competing red rose, named the Mrs. Miniver, to compete against Lady Beldon’s white rose. There is an interesting discussion of class between Carol, Vin, and the Miniver clan as Carol asks for the competing rose to be removed from the competition. While it was a tradition for Lady Beldon to win the prize, it shows a distinct breaking down of traditional classes for a lay person like Mr. Ballard to compete on the same level as the local nobility. After all, there is no place for class distinction in war and this movie is about the breaking down of individual concerns for the greater good. I also feel that it is prudent to emphasize the importance of the red rose in the mythology of England. The red rose is a symbol of England, similar to the bald eagle’s significance in the American cultural pantheon. By naming the ultimate victor of the competition the commoner’s cultivated red rose, it shows the importance of the underdog English overcoming the evil empire of Nazi controlled Germany. The rose’s name being Mrs. Miniver shows that she is a true symbol of England, as she keeps her house together despite both her husband and son’s military commitments. There is also a famous scene in which she is confronted by a wounded Nazi pilot and is able to subdue him and call the authorities. Mrs. Miniver was a fantastic and moving film for a variety of reasons, but most importantly is the ability for Hollywood to continue to thrive in a rationed wartime environment. Greer Garson has a fantastic acting performance in the role of Mrs. Miniver, and rightly earns the Best Actress Oscar for 1942. While I will avoid spoilers in this review, I do have to say that the movie does a fantastic job at surprising the audience in terms of loss and sorrow, while at the same time uplifting a country in the midst of war. Under different circumstances, it would be hard to say if Mrs. Miniver would have been the best film of the year. However, in these trying times the film was exactly what America needed to inspire its population engaged in one of the bloodiest conflicts in the history of the world. Although I attempt to opine on each film based on its own merits, it is difficult not to reflect on the previous Best Picture winners as a basis for formulating my views. Because we have seen so many exceptional Best Picture offerings, unfortunately, I found How Green Was My Valley somewhat disappointing. The film did have some beautiful black & white scenes of Wales set in the late 1800’s (although not filmed on location due to an on-going World War). It also provided dialogue that was moving and well acted. However, I think my expectations were too high. I knew this film had received 10 Oscar nominations and had won the awards for Best Picture, Best Director, Best Cinematography Black & White, Best Actor in a Supporting Role (Donald Crisp) and Best Art Direction Black & White – Interior. We also tend not to focus on (or even mention) films that were Oscar runner-ups but how could I not mention that this film beat out Citizen Kane, The Maltese Falcon, and Sergeant York. I have seen all of these films and enjoyed them more than this film. I even had recently read in Parade magazine that Clint Eastwood considered How Green Was My Valley as one the three movies that most influenced his directorial style. I don’t know, maybe I didn’t get enough sleep last night. I was very impressed with Walter Pidgeon (Mr. Gruffydd) in his role the town’s minister and surprised that he did not receive an Oscar nomination. Maureen O’Hara (Angharad) looks beautiful and is very expressive. Of course, 11 year old Roddy McDowall (Huw) is instantly recognizable and I had to chuckle thinking that he never could have imagined that 27 years later he would gain fame as Cornelius in Planet of the Apes. I did feel McDowell was very good, especially given his age. I mention the names of the characters but given their Welsh origins, the characters’ names are unrecognizable and unpronounceable (at least by me). The film does show a realistic depiction of the difficult life of Welsh coal miners and their families, the rise of unionism, and the sometimes hypocritical nature of religion and religious leaders and followers. The film also provides a glimpse into the necessity and growth of American immigration. My recommendation – How Green Is My Valley is a good film but not a great film. How Green Was My Valley was the 1941 winner for Best Picture, and the third best movie of the year. It would be hard for me to pose a valid argument for this film beating out Citizen Kane and The Maltese Falcon, but I will rationalize the decision with two paranoid thoughts. 1). William Randolph Hearst used his influence in the media to squash the possibility of success for Citizen Kane. Apparently he was offended at the thinly-veiled and harshly critical biopic based on his life as a newspaper magnate. 2). The Academy was not ready to legitimize the genre of film noir by recognizing the mastery of the subject matter that The Maltese Falcon demonstrated. 1941 is a terrific example of the Academy bowing to social and political pressure, and picking a well-made albeit safe choice for Best Picture. How Green Was My Valley is honestly a solid film that arguably could have won Best Picture in either the proceeding or subsequent year, but its 1941 win was as improbable as VCU making it all the way to the finals of the 2011 March Madness tournament. John Ford of Stage Coach, The Grapes of Wrath, and Young Mr. Lincoln fame directed this film about Welsh coal-miners. It also helped me realize that my life-long calling of being a coal miner might perhaps be far too dangerous to pursue. Actually, in the last few years there have been quite a few news stories about accidents in mines in locations across the globe from West Virginia to Chile, but despite the vast technological improvements it seems as if the mining of fossil fuels far below the Earth’s surface is still a dangerous occupation. How Green Was My Valley was released in late October of 1941, less than two months before the Japanese attack on Pearl Harbor. The film does have some uplifting moments, but concludes with a certain sadness that matched the audience’s ennui as the nation stood on the brink of the Second World War. The film was originally slotted to be shot in Technicolor and in Wales but war prevented that dream from being realized, and the Welsh mining village was instead built on a studio lot. This film was surprisingly political, and showed a clear favoritism towards the idea of unionization. Not that I am against that concept in any capacity, but I’m sure some would have called the film socialist propaganda. The film details the story of the Morgan family as they are forced to deal with the implications of modernization on their Welsh homestead. While there is not a distinct main character, the film is shown through the eyes of Huw Morgan (Roddy McDowell), as the young boy watches the social fabric of his family and the town begin to unravel. First there is the act of lowering the wages of mine workers, which causes the townspeople to strike for fair wages. The elder Morgan, Gwilym Morgan (Donald Crisp), does not support the decision to strike and is therefore victimized by the dissenters even though he does not break the strike lines. After the strike has concluded, workers returned to the mines only to find out that the highest paid workers have lost their jobs. This leads to two of the Morgan boys to travel toAmericato find work. The film begins to become much darker in the second half of the film, as the danger of mining work becomes more apparent. Overall, I did enjoy this film despite being depressed by the conclusion of the film. Apparently, no one in Hollywood seemed to mind depriving film viewers of a happy ending, but I can definitely say I would not have predicted this particular story arc. The cinematography of the film was beautiful, but it was hard for me not to wonder what the film would have looked like in Technicolor. Technicolor would have let us know exactly how green Huw Morgan’s valley was… (I’m sorry, I couldn’t resist that pun). The fact that the village was built on a set, makes the grandeur of the shots even more impressive. I also really enjoyed the singing of the miners, which provided an element that helped make the story feel more genuine. I will admit that half of the reason I haven’t included many character names in this review is the fact that Welsh is a very difficult language to understand, and there are points in the film where I have no idea what the characters are even saying. Subtitles would have provided a nice compliment to the Welsh utilized in the film, and would definitely have made the audience feel more like insiders than outsiders. How Green Was My Valley is not as timeless as its contemporaries Citizen Kane and The Maltese Falcon, but if you would like to see a romance/drama set in a turn of the century Welsh mining town, then this film is right up your alley.